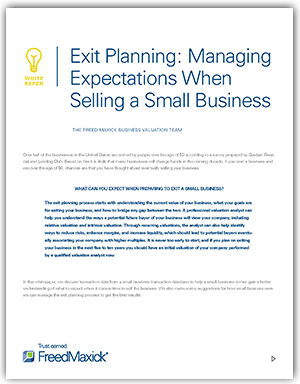 If the time has come to exit your business, our latest whitepaper from our Business Valuation Team will help you understand and address the realities and truths you’ll be facing. Get insights and observations on what to expect regarding revenue and EBITDA multiples, transaction costs, time on the market and discounts from original asking price. What Multiples Can You Expect? Will You Get What You Ask For? How Can You Increase the Attractiveness of Your Company Between Now and Exit? To get this valuable resource, simply complete and submit the form, today.